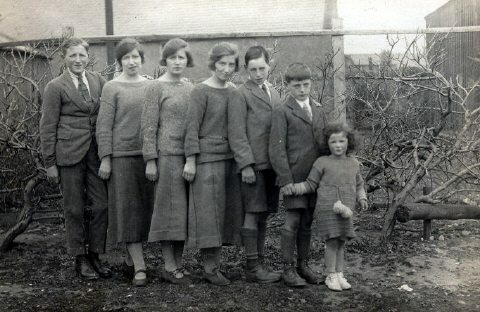 Cromarty Image Library - The Couper family - c1927? The Couper family - c1927? The two youngest children are still in Cromarty Helen Hogg and Ronald Couper. Do you know where this is? It's hard to tell from this black and white photo, but apparently all the sisters (Annie, Rhona, Chrissie and Helen) had varying shades of red hair. They must have been lovely to see all together like this. What a lovely line up. One I have not seen before. What a treat. And then there was one. Ronald, 2nd, from right, holding Helen's hand (she's the one), was 93 on Wednesday 17th October. He died peacefully early on Saturday 20th, and was buried yesterday beside the old Gaelic Chapel. As is the fashion in this very extended family, we afterwards repaired to the Royal Hotel Cromarty, where we celebrated his long and happy life, in the company of many friends and relations, his good wife Dora and their three lovely daughters.